Voice of the Collector: Do You Remember Shoebox Collection? 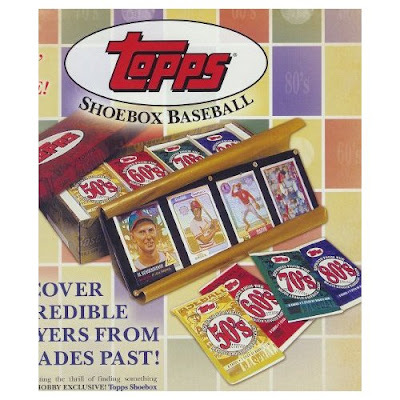 In 2004 Topps attempted to replicate the nostalgia of keeping baseball cards in a shoebox as children were known to do in the '50's and '60's. The product included a complete 96-card base set and 4 original buyback cards encased in a display holder. With retro and vintage being all the rage this year in the trading card market, it's easy to forget that there have been several products that started this fad earlier in the decade, from T-206 to Cracker Jack and Play Ball to T-205. Collectors in general, love a feeling of being connected to the past. That's one of the reasons we collect. The artificial attempt to recreate this sense of nostalgia in newer products is quite possibly one of the attributes that will define The Hobby decade we currently find ourselves in when we look back on the collecting years of 2000-2010. I bought this product back in '04 and still have it. It can still be found today for about $50 on eBay, Amazon, and other eRetailers. I've got two sets of this stuff. One opened and in pages, the other unopened. I should show off the 4 card vintage panel one of these days.